Four-time, two-weight Irish Senior Elite champion Roy Sheahan has made the decision to turn professional for the lucrative tournament. 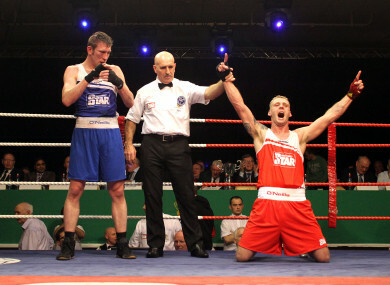 FOUR-TIME AND TWO-WEIGHT Irish Senior Elite champion Roy Sheahan is set to make his professional debut in the inaugural Last Man Standing tournament at Dublin’s National Stadium on 3 March. The groundbreaking Prizefighter-style competition will be the first of its kind in Ireland, and will see eight Irish professional middleweights bid for the €25,000 winner’s cheque (as well as a further €5,000 for their amateur boxing club). It’s understood Last Man Standing, the total prize fund for which is close to €50,000, will also see live professional boxing return to Irish terrestrial television for the first time since 2011. With the full eight-man lineup scheduled to be revealed at a press conference on 10 January, Irish-boxing.com reports that the hugely popular Sheahan has ditched the vest and intends to have a stab at the pro game in two months’ time. The 33-year-old Athy man won three Irish welterweight titles on the spin between 2006 and 2008, with an EU Championships gold medal sandwiched between. He was unfortunate, too, not to qualify for the 2008 Beijing Olympics, suffering a broken left hand in sparring at the Irish squad’s training camp in Italy just two months before the final European qualifier. The naturally-talented stylist left the sport in 2013 but returned for the 2015 Seniors at light-heavyweight, incredibly winning his fourth national title on the back of less than a month’s training. He’ll likely be the only debutant from the eight bidding to win March’s middleweight tournament, but will be no stranger to the three-round format considering his significant amateur pedigree. Though his intentions beyond that, in professional boxing terms, remain unclear, the Last Man Standing winner in March will become mandatory challenger for Luke Keeler’s Irish middleweight title, and so even aside from the significant financial prize, Sheahan will be incentivised to remain in the sport should he spring an upset. As well as the €25,000 prize for the eventual victor here will be a knockout bonus of €1,000. There are also staggered purses for runners-up (€5,000), semi finalists (€2,000), and quarter finalists (€1,000). Co-promoted by Red Corner Promotions and Assassin Promotions, March’s introduction to the concept will be the first of three scheduled Last Man Standing tournaments to take place in the Stadium in 2018. Email “Irish amateur legend a shock first inclusion in big-money Last Man Standing tournament”. Feedback on “Irish amateur legend a shock first inclusion in big-money Last Man Standing tournament”.